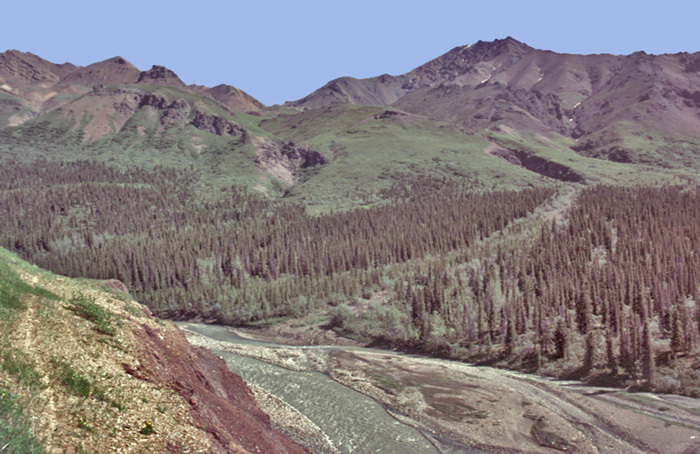 Almost half of Alaskas land is tundra, or land where no large trees can grow. Wherever there is permafrost you will find tundra. You'll also find it high in the mountains. So what is it? Trees can't grow high in the mountains because the temperatures don't stay warm enough long enough for the trees to grow. The land above this tree line on a mountainside forms alpine tundra or high-altitude tundra. The other main tundra type is arctic tundra. Arctic tundra occurs in the far northern areas, or what is called high latitudes of the earth. 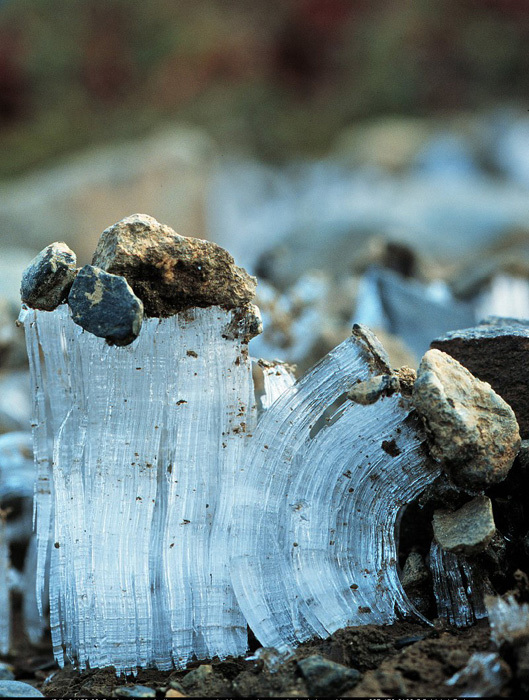 The permanently frozen ground in these regions does not allow the tree roots to grow deep enough to support the growth of trees. Just because there are no trees doesn't mean there is no life on the tundra. 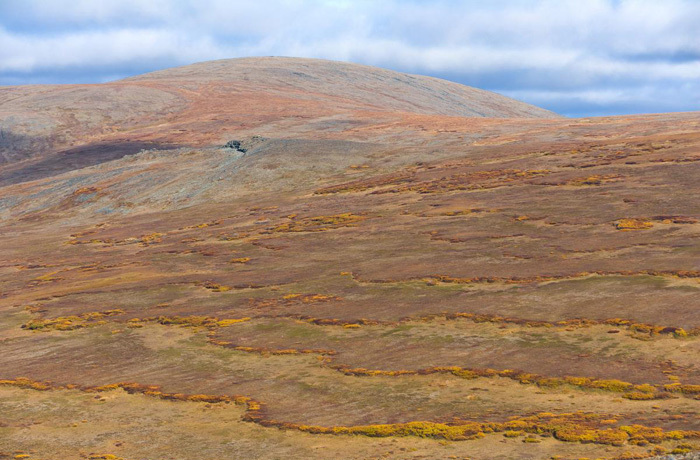 The moisture in the arctic tundra is like candy to millions of mosquitoes. These mosquitoes torment people and caribou, but birds love them. They offer lots of food for the millions of migrating birds that nest in the arctic each summer. 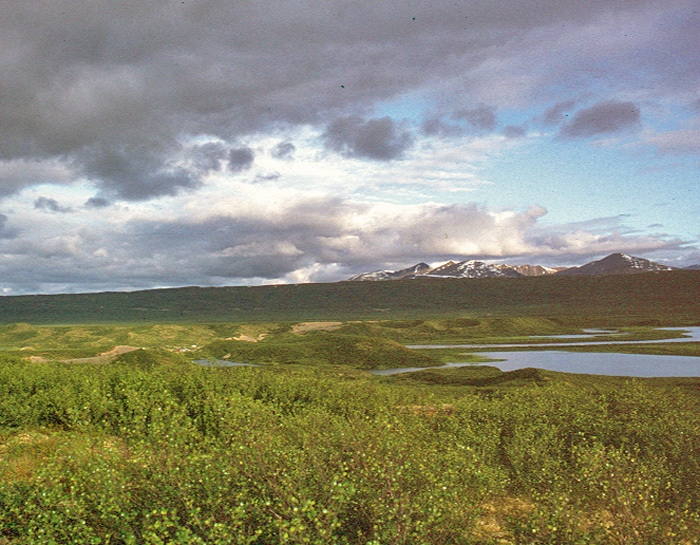 All kinds of plants thrive in the tundra habitat. Mostly, these plants are very small. Some are dwarf versions of larger plants found in other parts of the state. They grow low to the ground to avoid the near constant winds that roar across the treeless tundra. And for every tundra plant, you'll find a community of insects thriving. You might think that this vast treeless land would be easy to walk across. Often it is not. The area can be quite wet and boggy, because the moisture doesn't drain into the frozen ground. The plants grow in mounds. So you either slog though the bog around the plants or try to walk across the tops of the plants. 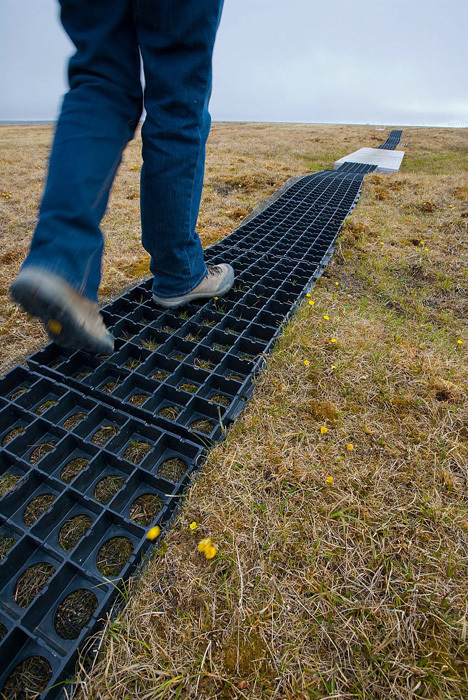 You might be tempted to step across the mounds like you might step across rocks in a stream. But these spongy growths or tussocks are not as solid as rocks. It is easy to lose your footing and fall. So your feet get wet no matter what. Tundra plants have shown that they can survive the cold and wind. They don't do as well when trampled during their short summer growing season. Once a plant is killed, it can take years for a new plant to grow. Winter is the only safe time to travel, especially by vehicle, across the tundra. The snow and ice provide a layer of protection the fragile land.